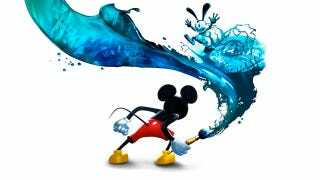 Disney's Epic Mickey made its (rather late) to the Wii in Japan last week, debuting in the top ten, but not in the top five. Another adorable mascot, Nintendo's Kirby, fared much better overseas. The week's real winner, however, was Sega's J-League Pro Soccer Club o Tsukurou! 7 Euro Plus for PSP. The soccer sim moved more than 100,000 copies during its first week on the Japanese market, according to sales tracker Media Create. Kirby, therefore, had to settle for second, with Kirby Mass Attack for Nintendo DS selling just shy of 75,000 units. Other top ten debuts include Toriko: Gourmet Survival for PSP and All Kamen Rider: Rider Generation for DS. Developer Prope, the studio founded by Yuji Naka, managed to score a top ten showing with its latest Wii game Family Fishing, but did not light up the charts. Here are the top 20 bestselling games in Japan for the week of August 1 to 7. On the hardware side, Japan was PlayStation country last week, with the PSP and PS3 ruling the charts. PSPgo, notsomuch. Zero people bought one last week. Japanese gamers are now cooling their jets on a Nintendo 3DS purchase. The stereoscopic 3D system was outperformed by the Nintendo DSi XL last week.